First gas well in county, and one of world's most productive. Drilled, 1878. Caught fire in 1881, burning for years with tremendous roar and brilliance. Later was controlled and piped to Pittsburgh. Site lies 500 yards S.E. near railroad. Location. 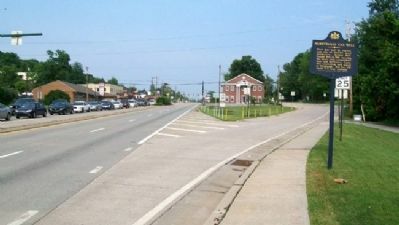 40° 25.621′ N, 79° 41.853′ W. Marker is in Murrysville, Pennsylvania, in Westmoreland County. Marker is at the intersection of William Penn Highway (U.S. 22) and Reed Boulevard, on the right when traveling east on William Penn Highway. Touch for map. Marker is at or near this postal address: 3865 Reed Boulevard, Murrysville PA 15668, United States of America. Touch for directions. (approx. 3.7 miles away); Pontiac's War (approx. 6.1 miles away); Welcome to Bushy Run Battlefield (approx. 6.1 miles away); Ambush (approx. 6.2 miles away). Touch for a list and map of all markers in Murrysville. More. 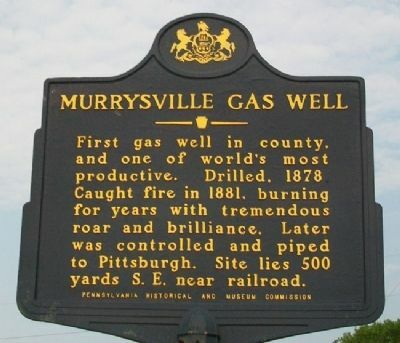 Search the internet for Murrysville Gas Well. Credits. This page was last revised on June 16, 2016. This page originally submitted on June 25, 2011, by William Fischer, Jr. of Scranton, Pennsylvania. This page has been viewed 662 times since then and 9 times this year. Photos: 1, 2. submitted on June 25, 2011, by William Fischer, Jr. of Scranton, Pennsylvania.